Perhaps looking for an answer to rival Ben & Jerry's Pint Slices, Haagen-Dazs introduces new Cookie Squares. 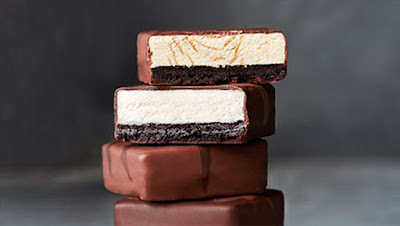 The new dessert features a thick square cookie layered with ice cream and covered in chocolate. It basically looks and sounds like a higher-end Klondike bar with a cookie inside. - Dulce de Leche Ice Cream - A dark chocolate cookie topped with Dulce De Leche ice cream (swirled with caramel) coated in crispy milk chocolate and a drizzle of dark chocolate. - Vanilla Ice Cream - Vanilla ice cream atop a dark chocolate cookie, dipped dark chocolate, and finished with a milk chocolate drizzle. You can find new Haagen-Dazs Cookie Squares at retailers nationwide in boxes of three individually-wrapped bars.